Stealing Mr. Smith is an historical fiction novel written by Tanya Williams. Life didn’t seem at all fair to Bernice. She was only nine years old, and she had suddenly become a nurse for her ailing mother and the mother to her six-year-old sister. Her brothers were far more fortunate in that they at least got to go to school several days a week when they could be spared from helping their father with the farm. Their big sister, Alice, had escaped the misery of their dirt-floor house and meager rations. She had married and moved away. Bernice had thought that she would eventually send for them to come live with her -- it’s what Bernice would have done -- but that letter never came. Much as she loved her mother, the darkened sick room where she had to spend hours cleaning vomit and dripping water into her mother’s parched mouth was horrible; her everyday life was dark and depressing. Once, some time before, Bernice found a litter of kittens. They were tiny and sweet, and she fell in love with them. They were hers, and for once in her life, she felt what she thought might be happiness. Then her father came upon her laughing as she watched their antics. He said they couldn’t feed them, and he’d take care of them for her. She watched, horrified, as he placed them in a burlap sack and tossed it into the Big Sioux River. Something in her died that day. 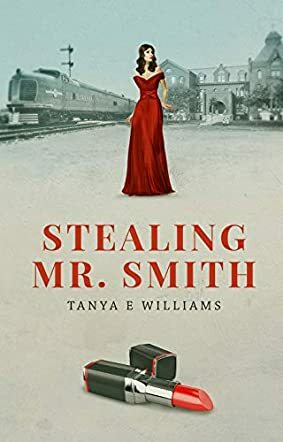 Tanya Williams’s historical fiction novel, Stealing Mr. Smith, is an engrossing story of a young girl and her family, which is set in the 1940s. Williams eloquently details how poverty and misfortune turn Bernice’s once happy and fun-loving father into a dour and taciturn stranger, and transforms Bernice herself from a child capable of wonder at a kitten’s antics into a young woman whose dreams have died and who has become obsessed with getting a husband. I was struck by the unfairness of the cultural expectations for women and girls that plagued Bernice as she was growing up and later as she tried to make her way in the business world, and I was saddened by her growing loss of confidence in her own abilities to survive and thrive. Williams’s characters are beautifully drawn, especially Bernice and her sister Patricia, and her plot brings the culture of the late 1940s and early 1950s to life. Stealing Mr. Smith is most highly recommended. Stealing Mr. Smith by Tanya Williams is a historical fiction novel set in the 1940s and unfolds on a farm located five miles from the center of Sioux Falls. Bernice Rosin is a young girl that has to grow up very fast. The family is poor and her mother is terminally ill. With her older sister, Alice, already married and out of the house, she is saddled with the task of taking care of her other siblings. When her mother died, her brothers left to work on a farm and Bernice and her sister, Patty, are placed in an orphanage in South Dakota, where she counts the day to be able to leave and be free. Finally when she is allowed to leave, her short experience with her father and his rich widow partner sets her on a path to catch a husband that can take care of her, even if she has to steal him. Tanya Williams's Stealing Mr. Smith is a thought-provoking story about a sad and determined little girl that has to face the realities of life at the tender age of 10 years old. The story takes us inside an orphanage where Bernice and Patty find themselves after their mother dies and it is interesting to note how differently the two girls react to their new situation. Tanya Williams has a great knack for story development as she navigates her readers between Patty's and Bernice's perspectives and it is very effective in giving us a full grasp of the story. And as Bernice sets out to steal Mr. Smith, one may even feel sympathy for the woman determined to find the love and security that has been denied her all her life. This is a novel that makes you think about relationships. Tanya Williams takes you back to the post WWII era when young women are beginning to find more independence in the work force and living arrangements. Bernice Rosin has no power over her circumstances as she cares for her sick mother and later gets left at an orphanage with her little sister. She does have control over her attitude and chooses to blame others for her misfortune, while bitterness wells up in her heart. Stealing Mr. Smith is a continuation from Becoming Mrs. Smith as John Smith's life picks up after his first wife, Violet, passes away. He is now being pursued by Bernice as she hunts for the husband who meets all her qualifications, regardless of her previous escapades with other men. Stealing Mr. Smith is written in the first person, switching from Bernice to her younger sister, Patricia. Tanya Williams displays a dual perspective of Bernice's behavior and the effect her negative attitude has on those around her, giving a more accurate view of her personality. I found this novel interesting as Williams shows two sisters with the same background growing up completely differently, revealing that the outcome coincides with the outlook one has on life. Though I would like to judge Bernice for the poor choices she made with men, the author makes me question my own path were I in her shoes. The history Williams put within these pages made this time period come alive. It was thrilling that she centered her story around Sioux Falls, as this is a beautiful oasis among corn fields and soy bean farms.